CANCUN, Mexico - Today, one of our readers emailed photos of an underwater installation by Jason deCaires Taylor. The sender stated that the installation was a tribute to the slaves who were thrown overboard to drown during the Middle Passage of the slave trade route. 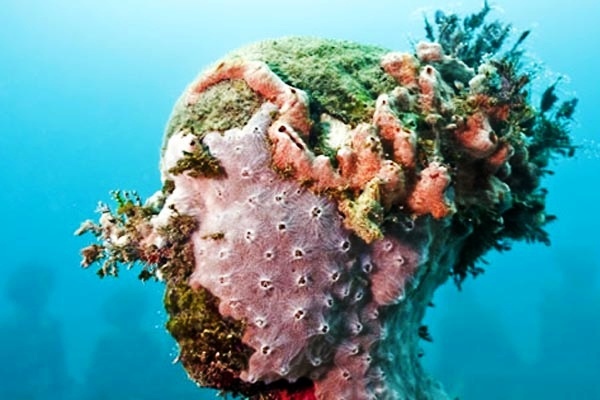 The photos were intriguing and upon further research we discovered that the sculptor, Jason deCaires Taylor was the founding member of an underwater museum called MUSA (Museo Subacuático de Arte). According to Taylor's website, "the museum was formed in the waters surrounding Cancun, Isla Mujeres and Punta Nizuc. The project founded by Jaime Gonzalez Cano of The National Marine Park, Roberto Diaz of The Cancun Nautical Association and Jason deCaires Taylor. The installation consists of over 450 permanent life-size sculptures, made from specialized materials used to promote coral life, with the total installations occupying an area of over 420sq metres of barren seabed and weighing over 200 tons. The museum is one of the largest and most ambitious underwater artificial art attractions in the world. Jason deCaires Taylor is an internationally acclaimed Eco-sculptor who creates underwater living sculptures, offering viewers mysterious, ephemeral encounters and fleeting glimmers of another world where art develops from the effects of nature on the efforts of man. The photos below were taken by tourists visiting the installations. To view his complete portfolio of hi-res professional photos of his sculptures please visit his website and enjoy. The 20th Century Surrealist Painter René Magritte, is one of my favorite artists. I particularly like the Surrealist movement because each person brings their own psychology to bear when interpreting the paintings. Enjoy!